Who are the Pueblo Indians? In Native American usage, pueblo has a deeper meaning. There is the Pueblo culture, the people themselves, the Pueblos. Pueblo people have lived in this sty le of building for more than 1,000 years. 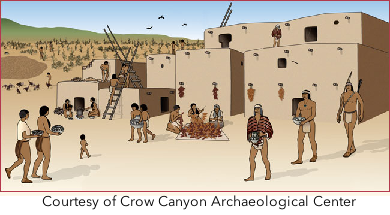 Pueblo People – Pueblo Indians are American Indians who live in pueblos and have a long tradition of farming. Pueblo Indians who lived long ago are sometimes called the “ancestral Pueblo” because they are the ancestors of today’s Pueblo people. Sometimes the ancestral Pueblo people are called the Anasazi. In this history, we use “Pueblo people” or “Pueblo Indians” to talk about all Pueblo people throughout history, including those who lived long ago. Any of some 25 Native American peoples, including the Hopi, Zuni, and Taos, living in established villages in northern and western New Mexico and northeast Arizona. The Pueblo are considered to be descendants of the cliff dwellers and are noted for their skilled craft in pottery, basketry, weaving, and metalworking. The ancient Cuyamungué Pueblo site is on the land of the Cuyamungue Institute. An excavation of the ruins of the Cuyamungué Pueblo was begun in June, 1952, by the Museum of New Mexico and the School of American Research. These excavations revealed that the Pueblo was first built around 1300. Different phases of construction indicate that the Pueblo was periodically occupied and abandoned, only to be reoccupied. The period of greatest population was from 1400 – 1500. Today, the Cuyamungué Pueblo is a under the protection of the Cuyamunge Institute working in cooperation with the Pojoaque Pueblo. The Board of Directors of the Cuyamungue Institute understand the importance of protecting and preserving this sacred land. We take this role of stewardship very seriously. More information on History of the Cuyamungue Institute Land.